30 Doradus is a large region where stars are forming. Found in the neighboring Large Magellanic Cloud, it is relatively very close to Earth. Giant stars are producing intense radiation and powerful winds that blow off material. 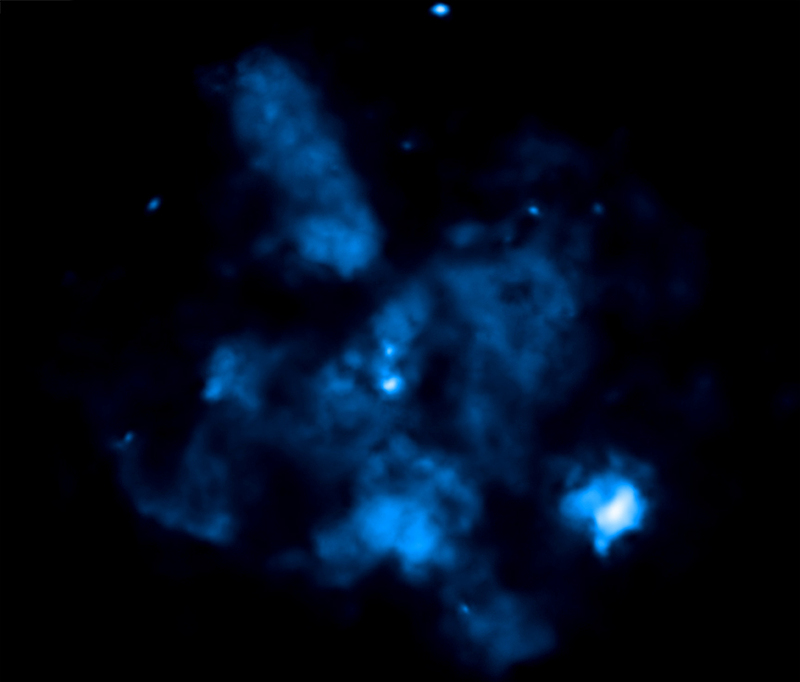 This produces superheated gas that Chandra sees in X-ray light (blue). The star-forming region, 30 Doradus, is one of the largest located close to the Milky Way and is found in the neighboring galaxy Large Magellanic Cloud. About 2,400 massive stars in the center of 30 Doradus, also known as the Tarantula Nebula, are producing intense radiation and powerful winds as they blow off material. Multimillion-degree gas detected in X-rays (blue) by the Chandra X-ray Observatory comes from shock fronts -- similar to sonic booms --formed by these stellar winds and by supernova explosions. This hot gas carves out gigantic bubbles in the surrounding cooler gas and dust shown here in infrared emission from the Spitzer Space Telescope (orange). 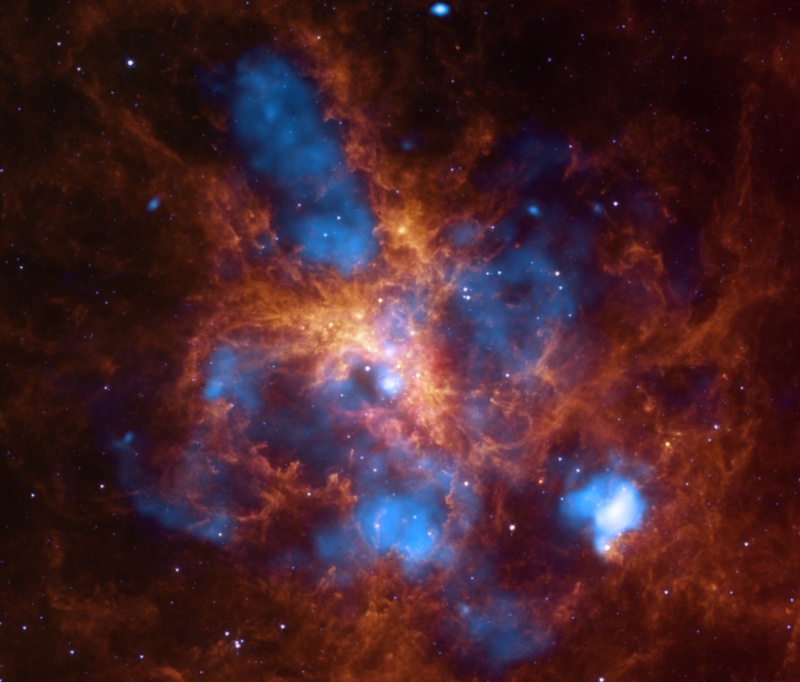 30 Doradus is also known as an HII (pronounced "H-two") region, created when the radiation from hot, young stars strips away the electrons from neutral hydrogen atoms (HI) to form clouds of ionized hydrogen (HII). It is the most massive and largest HII region in the Local Group of galaxies, which contains the Milky Way, Andromeda and about 30 other smaller galaxies including the two Magellanic Clouds. Because of its proximity and size, 30 Doradus is an excellent target for studying the effects of massive stars on the evolution of an HII region. The Tarantula Nebula is expanding, and researchers have recently published two studies that attempt to determine what drives this growth. The most recent study concluded that the evolution and the large-scale structure of 30 Doradus is determined by the bubbles of hot, X-ray bright gas confined by surrounding gas, and that pressure from radiation generated by massive stars does not currently play an important role in shaping the overall structure. A study published earlier in 2011 came to the opposite conclusion and argued that radiation pressure is more important than pressure from hot gas in driving the evolution of 30 Doradus, especially in the central regions near the massive stars. More detailed analysis and deeper Chandra observations of 30 Doradus may help decide between these different ideas. Credit X-ray: NASA/CXC/PSU/L.Townsley et al. ; Infrared: NASA/JPL/PSU/L.Townsley et al. Coordinates (J2000) RA 05h 38m 42.9s | Dec -69° 06' 3"
I read all your emails and enjoy the pictures you take. It is wonderful. One of the largest star-forming regions located close to the Milky Way. About 160,000 light years from Earth. X-rays from Chandra X-ray Observatory with infrared observations from Spitzer. About 1100 light years across. X-rays are blue and the infrared orange. In the constellation Dorado in the Southern Hemisphere.